A serendipitous gift from the dye pot! 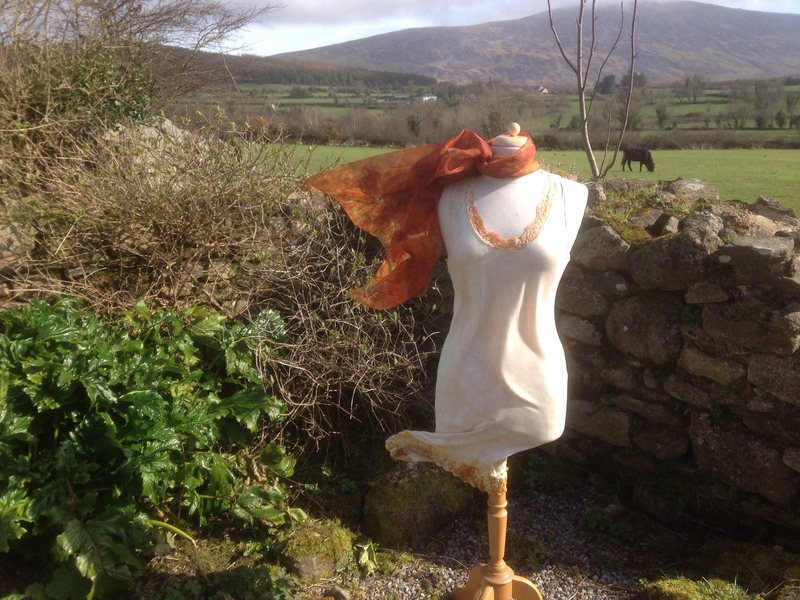 The weekend before last I picked up several apron style dresses in gorgeous linen at a blowout sale in Dublin. They were all layered with a lace edged viscose under shift kind of thing, way too frilly and girly for my plain taste! Anyway, most of the dresses had this piece actually attached to them so I had to cut it off, one of them was in a slightly different style and the under shift with this one was more like a cross between a long Tshirt and a petticoat in the brightest white you could possibly imagine. Anyway, yesterday I decided to bundle it up with eucalyptus and tea leaves then popped it in the pot while I was eco printing a couple of organza scarves. Imagine my surprise to discover it didn't give even the faintest prints from the eucalyptus leaves or tea at all except on the lace edging (I think that this must be polyester although it didn't say on the label), instead it transformed itself into the softest and most attractive soft shades of gold and apricot, the perfect shift to dress my mannequin! This serendipitous gift will be worth it's weight in gold, I hate a naked mannequin but have always found it really difficult to find a nice neutral outfit for mine against which the naturally printed wraps and scarves stand out, my search is over!!! Please excuse the quality and composition of these images, the wind was wild and the sun made it difficult to take good pictures but at least you'll get an idea of what why I'm happy. 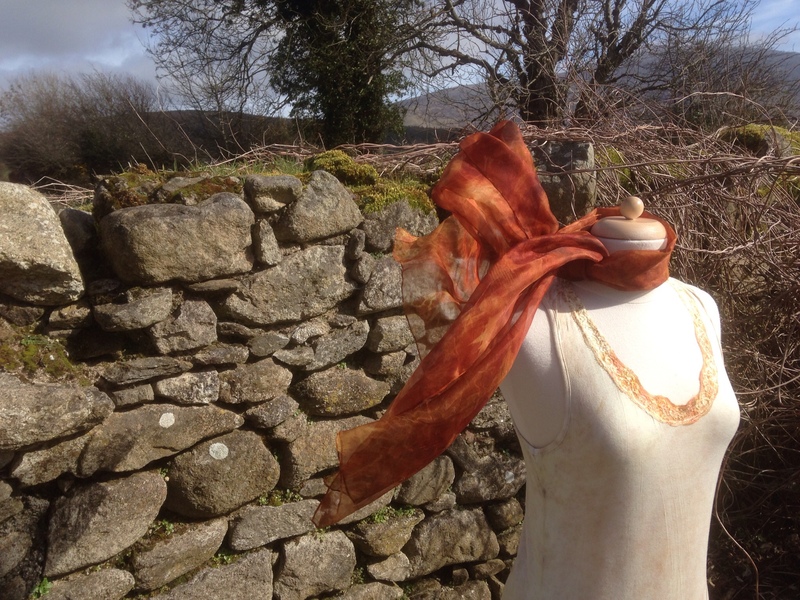 This entry was posted in Eco bundling and dyeing, natural printing, Natural printing and dyeing and tagged eco bundling, eco print, eco printing, Eucalyptus, natural printing, natural printing and dyeing by Nicola. Bookmark the permalink.